Click on the images above to be shown the finished drawing. 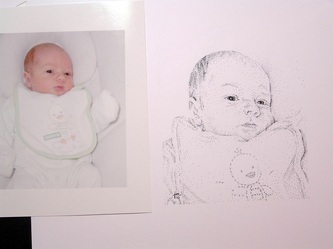 Created by placing hundreds of dots one at a time in a pattern of light and dark areas, my Baby Portraits are close to 4.5 - 5 inches square in size and are made up of thousands of tiny dots. 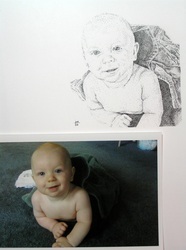 The exact size of the final drawing can vary depending upon the cropping of the reference photo and its clarity. 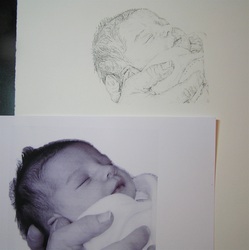 I strive to represent the smooth skin and delicate features of newborns in great detail, in order to do this the image must provide these details clearly. If the reference photo provided is not crisp enough to provide the amount of detail that I need for this size drawing, I will contact the client to discuss possibilities of a different photo and the option of a smaller sized drawing.